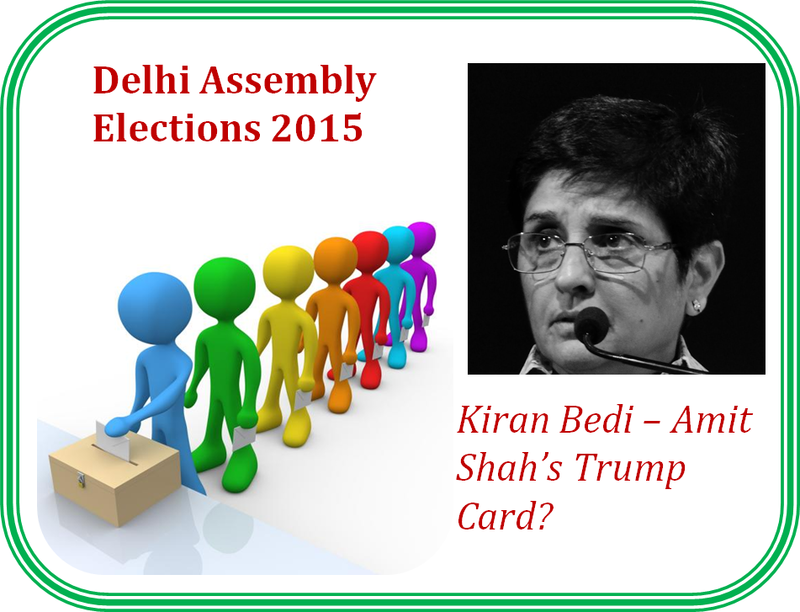 Home > Politics > Thoughts > Kiran Bedi - Amit Shah's Trump Card for Delhi ? Kiran Bedi - Amit Shah's Trump Card for Delhi ? Finally after all the delays and discussions, Kiran Bedi joined BJP this week amidst all the fan-fare. BJP President Amit Shah himself was present at the welcoming press conference flanked by the top names in the party including Arun Jaitley, the finance minister. Now anyone, who follows politics even a bit, would agree that one need not be a Nostradamus to have predicted that this was long coming. As early as last assembly elections in Delhi, Bedi has been in talks with BJP. Over the general elections in the country in 2014, her tweets have been gradually shifting from that of a sympathizer to ardent supporter of Prime Minister Modi. All that was left in final announcement was an ideal opportunity and agreement on responsibilities. Bedi having always been comfortable at leadership roles rather being a team player obviously wanted the same in politics and that had kept her entry into politics delayed. So what changed now? The overall political scene was exactly what was required for Bedi to jump into the ship. First of all it was the need of hour. Once the politics is right for something, most of us have come to know that the best person to realize it is none other than the Chanakya himself – Amit Shah. Now that he has handled the strategy for BJP in the general and various state elections, behind the media glare for most of the time, he is back in Delhi to steer the elections away into BJP’s favor for the state assembly here. As Kejriwal pounced on Satish Upadhyay immediately post his announcement as the election committee head, Shah realized that the available pool of leaders in the state party have all been in politics for long enough to have some skeletons hidden in closet. Now these may not come out with proof which could withstand the probity of law but politics isn’t about that. An accusation with apparent truth is enough to cause long lasting damage which no defamation case can help recover. Now only issue left was the role she would have in the party after joining. BJP at the moment had a number of leaders who were ready to pounce on the chief minister-ship. Apparent infighting was just days or probably moments away from coming out in public. If one asks me, the only thing that was putting it away until now was the fear of big daddy – PM Modi. Everyone in the party as of now is well aware that slight indication of inciting such an incident would kill all their chances of moving up in their career. Now, Shah was quick to realize that all these leadership were competing with one another along with competing against the Congress and AAP. This was bound to cause damage to the party’s chances in capturing the power with the majority they are eyeing. So the way forward was to bring in someone from outside with no specific bias towards any one of those leaders, arm her with apparent support of himself and Modi and make her the face of the party for elections. And so it happened and we all show it live on the television screens. She was welcomed into the party and then at the party headquarters separately. She got the microphone to talk while other state leaders heard her in background. She was her usual self in most part quipping at some of the party workers trying to have a jolly time. Now the only thing left to be seen is if BJP announces her as the CM candidate for the party pre or post elections. Whatever happens, she already is the face for the party and is going to be most talked about leader from BJP’s end. Strategy of course would be handled by Shah and NaMo would be the superstar of the party. Bedi would be petted locally against Kejriwal and she is definitely going to cause a lot of damage to his chances in the state. This would serve two purpose to the party – one counter the “anti-corruption campaigner” image with exactly the same image and other, not letting the fight become Modi vs. Kejriwal. BJP would not like the two to be pitted against each other not only to save face in improbable case of loss but also to prevent rising of latter’s profile to be pitted against their top leader – one who is the Prime Minister of the country. A single statement – “Modi Ji ka Sapna pura karoge ya mein karwau” was enough to indicate the powers she had been vested with and the confidence she had in her abilities. However it would't be an easy ride for her. The state party unit has a line-up of leaders who have been waiting for quite some time to get to the big chair. Now someone not more than a week old in the party, if announced a CM candidate, would definitely face friction. Some infighting would be inevitable in such scenario. It would be a tough task for Modi-Shah duo to ensure that such infighting does not lead to actual impact on the results of elections. They would have to work overtime to keep these leaders in check who believe their rightful share is being given away. It is only time that would tell how they manage to handle bruised egos. Let's see how all this actually impacts the decision of these elections but one thing sure is - the fight in Delhi is definitely going to become more interesting and fierce now. I am sure many would like to contradict all that is written here and would have opposing views. All those are equally welcome as is the support to my views. Just express all of them in the comments and be courteous.